A surprisingly sophisticated and intuitive managed learning environment that can ably assist the teacher in administrative, pedagogical and assessment tasks. Otus Teacher is a surprisingly sophisticated and intuitive managed learning environment designed to assist a teacher in the administrative, pedagogical and assessment functions of their work. The app is particularly developed for the iPad but it is also, usefully, web based. This review is based on the latest OtusTeacher v2.0. On starting the app for the first time a teacher will feel immediately comfortable with the thought processes underlying the interface; everything is where it should be and the menu and navigation systems make sense. Setting up a class could not be easier, with the correct level of detail to sufficiently differentiate classes with toggle buttons for letting students and or parents have access also. The class code for students to gain access for the first time is a neat little time saving aspect for the busy teacher. The powerhouse of the app is the ‘Bookshelf’ section, obviously designed by a teacher with experience of gathering resources for lessons. Essentially, links to the resources, which range in variety from pdf’s to youtube videos are stored in folders which you can then assign to a class or group. Any seasoned teacher will find this aspect of the application extremely useful and time saving. The assessment facility is comprehensive, easy to use and fully trackable. A good choice of the type of assessment with annotate, assignment, paper, quiz and test; more than enough to gauge the understanding a student has of the learning materials provided. All the usual facilities ranging from multiple attempts to timed tests are within the setup screen. But an especially powerful feature is the facility to link these tests to a set of pre-loaded or bespoke curriculum standards. 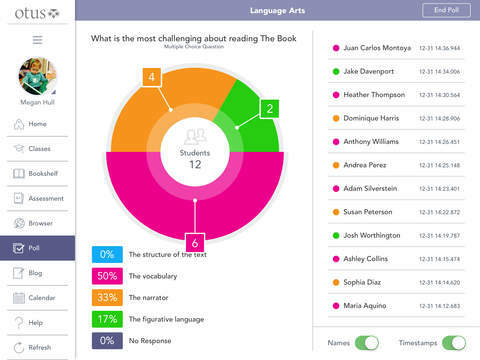 The ‘Poll’ feature in the application provides an excellent tool for the teacher to quickly test student understanding. The facility provides multiple choice, true or false or a free response types of question, all are customizable and can be saved as a template for further use. 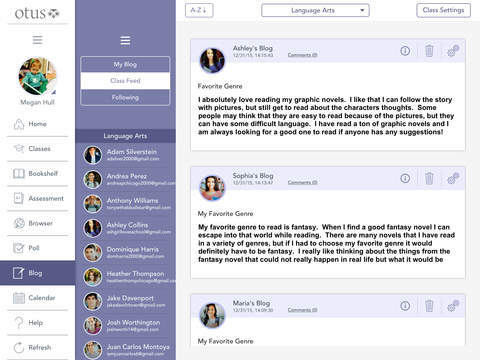 The blogging section of the application makes Otus Teacher stand out from other Ed-Tech apps and will be seen as a really useful tool for the teacher and increase student engagement. Blogging is recognised by many as an essential requirement for students to think about how they have learnt new things and share their experiences with the teacher and the rest of the class. This self-contained feature provides all the ingredients for developing student dialogue to facilitate deeper learning. The pièce de résistance of the programme is the access to a web-based interface that include two extremely powerful tools. First up is the “Toolbox” section where some impressive third party applications, Kahn Academy for one, can be fully incorporated into the learning system. Secondly the “Analytics” section fulfils the criteria for the tracking and evaluation of ‘deep learning’. Every conceivable action the student makes within the system, including some third party apps, is recorded and presented in this section, providing an excellent analysis tool to facilitate a greater understanding of what the student can and cannot do. The application has a thriving community of users and the website demonstrates a high level of quality support materials; always a good indication of a successful company. Overall this app is extremely worthy, it has a collection of features that set it apart from the individual stand alone specific app, but it is up there with the sophisticated market leading managed learning environment suites. This is an app obviously developed by a working practitioner which does not impose technical restrictions and opens up a possibility for real administrative time saving, incorporating exciting and stimulating learning resources which can all be tracked and assessed. It has my vote! Otus is an easy-to-use, yet powerful classroom tool that brings the best iPad and Chromebook education features together into one secure environment with a single login. Both Teacher and Student versions are free. 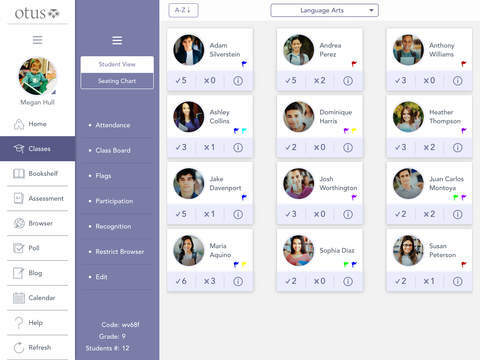 Otus helps maximize learning by providing educators the ability to organize classes, take attendance, differentiate lessons, recognize behavior, communicate with all stakeholders, poll students, curate and share resources, create and grade assessments, write blog posts, organize with the Otus Calendar, multitask with the Otus Split Screen, annotate PDFs with Otus edPen, connect to the best educational resources, and much more. 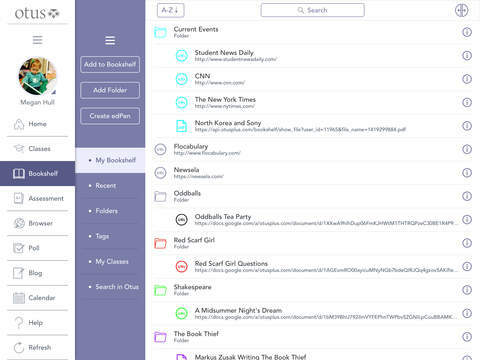 Log into your Otus account from any web browser at my.otusplus.com in order to use all of our free LMS tools, Teacher Analytics, and Toolbox integrations. Otus is designed by teachers, for teachers.